Vibes Modular announced today that the company will be attending the Mobile World Congress 2018 show and will be presenting its products at the ShowStoppers event at MWC. The show will be held in Barcelona Spain. The company will display its sustainable share-worthy, device-agnostic accessories for the mobile industry's most popular smartphones. On the heels of a tremendous showing at the media invite-only ShowStoppers event at CES in Las Vegas Nevada in January 2018, Vibes Modular is excited about attending MWC. "The interest we have received from ShowStoppers at CES was incredible. We have already met with a few parties from the middle east, Europe and Asia expressing interest in strategic partnerships", says Shane Wilder, CEO of Vibes Modular. "There is a growing global interest in our products. We think MWC will open additional doors as leaders in mobile recognize the incredible disruptive opportunity for shareable and sustainable smartphone accessories." The Mobile World Congress show runs from February 26 – March 1, 2018. The Vibes Modular team will demonstrate its market available "ROXON™ Modular Smartphone System line of products which starts with its global patent pending BASEROX™ Smartphone Case. "When we show the BASEROX case to consumers and the trade we hear a consistent message 'Why didn't I think of that', says Scharles, Wilder, Co-Founder and Chief Technical Officer of Vibes Modular. 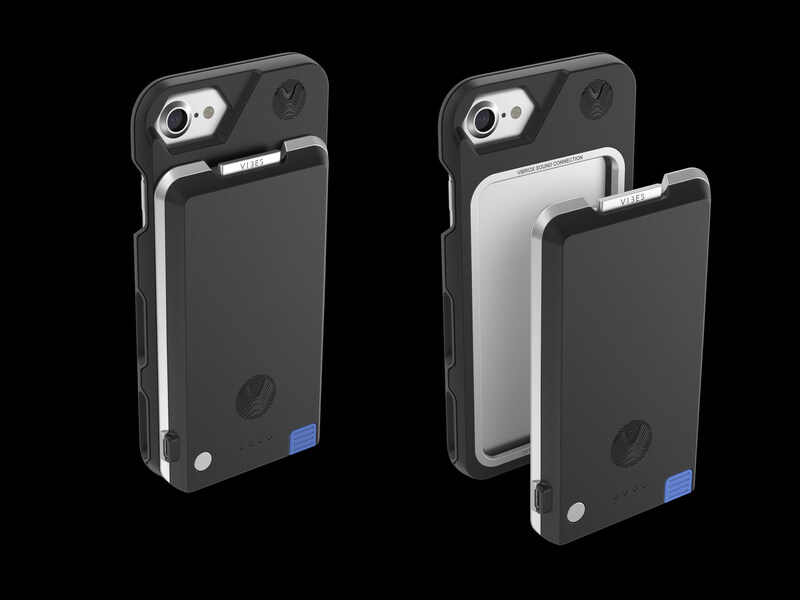 The reverse side of the BASEROX case is carved out and has a patented trim ring which allows for the simple snap on, snap off usability for its accessories. And if a user changes phones, they simply need a new inexpensive BASEROX case. All of the ROXON line of accessories will still back snap in place. In addition, the company will be showing its VOLTROX™ thin form factor Power Bank and the VIBROX™ Sound Engine at MWC which provides robust sound that emanates from a Bluetooth enabled vibration powered carbon fiber surface and includes conference calling, all from a thin lightweight accessory (that also snaps on to the back of the BASEROX case.) The STICKYMOUNT™ adapter allows users to attach their VIBROX speaker virtually anywhere: the kitchen, a studio, a cooler, a surfboard, or shower, for example. As a bonus feature, the VIBROX Sound Engine is waterproof, and will be available to ship in Q2. Vibes Modular has several products in its roadmap, some of which will be displayed at the ShowStopper booth. Just ask for Shane or Scharles and they'll happily walk you through the company's product development roadmap. "One of the questions we get asked a lot is 'Tell us about your manufacturing capability'. We chose the best in the world that can scale to millions of products. Capacity is in place", says Scharles. This year at Mobile World Congress the organization's central theme is sustainability. According to its website they are "Bringing the Sustainable Development Goals to life at MWC 2018." Vibes Modular sustainable positioning is based upon how the products can be reused. So many products are deemed unusable once a new smartphone version is created. To hedge against obsolescence from upgrading, one only has to change its Vibes Modular case (BASEROX) and continue to snap on Vibes Modular smartphone products. To learn more about the MWC ShowStoppers event go here . To learn more about or to purchase Vibes Modular products now, go to VibesModular.com.